The Columbus Blue Jackets have a new captain. 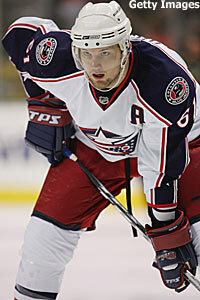 Too bad for Rick Nash it's probably too late for him to lead a turnaround that will get his team into the playoffs. Two teams which likely played themselves out of the postseason chase this month will meet at Nationwide Arena on Friday when Nash and the Blue Jackets face the Chicago Blackhawks. Columbus (31-28-11) has 12 games left and Chicago (33-31-7) has 11 remaining, but they are tied for 13th in the 15-team Western Conference. Nash, the Blue Jackets' leader with 35 goals and a career-high 58 points, was named the fifth captain in team history Wednesday to replace the recently traded Adam Foote. "It's just a dream to be in the NHL, and to actually be a captain of an NHL franchise is really an honor," said Nash, who served as an alternate captain since the start of the 2005-06 season. The first overall pick in the 2002 draft is likely to be the Blue Jackets' top goal scorer for the fifth straight season. Nash is a three-time All-Star - he had a hat trick in this year's game - and is the club's all-time leader with 151 goals. "Obviously I'm going to lead by example, and I thought I was doing that already," the 23-year-old Nash said. "I think the biggest thing is to just change myself in the (locker)room a bit." Nash, though, was one of three Columbus players who failed to score in a shootout in a 4-3 loss at Edmonton on March 2, and that defeat was the first in a three-game losing streak (0-1-2) that seriously damaged the Blue Jackets' playoff hopes. The skid ended with a 5-3 victory over Tampa Bay on Sunday as Nash assisted on two goals. It was the Blue Jackets' first win in eight home games since beating Vancouver on Jan. 15. "We've been disappointed with the way we've played at home since the All-Star break," said center Michael Peca, who scored his first goal in 27 games. "It's good to see us be a little more resilient tonight." While Columbus has been off the last four days, the Blackhawks have suffered two disheartening defeats. Their overall losing streak reached four games with a 3-0 home defeat to Carolina on Wednesday, one day after a 3-1 loss at Detroit. "The last two games, I don't think the effort's really been there and the results, obviously, haven't been there either," Chicago winger Patrick Kane said. Fellow rookie Corey Crawford has not played nearly as poorly as his team has offensively in those two games, stopping 73 of the 78 shots he faced. It's unclear if he will make a third straight start in place of Nikolai Khabibulin, who has missed the last 11 games due to back spasms. While Chicago is trying to avoid missing the playoffs for a fifth consecutive season, Columbus has never qualified in its seven-year history. Nash has three goals and three assists in this season series as the Blue Jackets have taken three of five meetings, but the Blackhawks won 7-2 at Columbus on Feb. 13 in the most recent matchup.